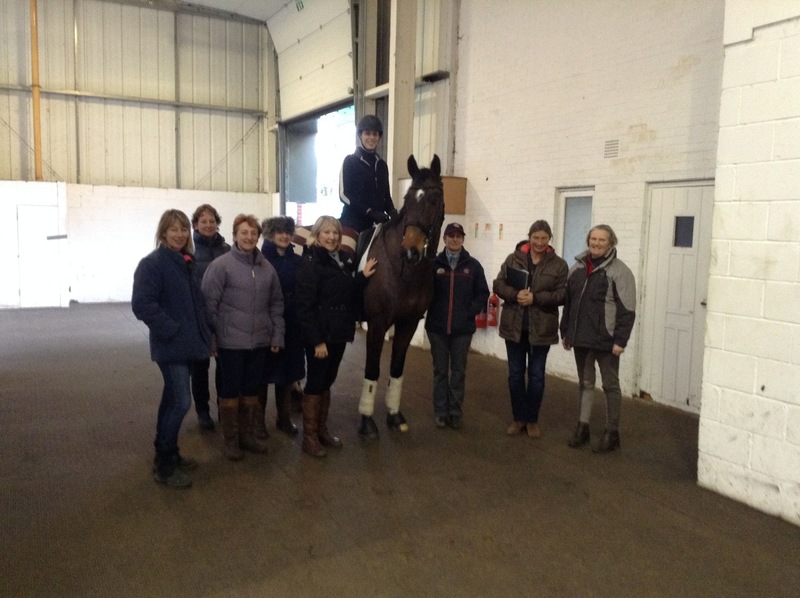 The annual two-day training course for Fellows and BHSI’s was held at Addington Manor Equestrian Centre on Wednesday and Thursday, 8 and 9 January 2014. 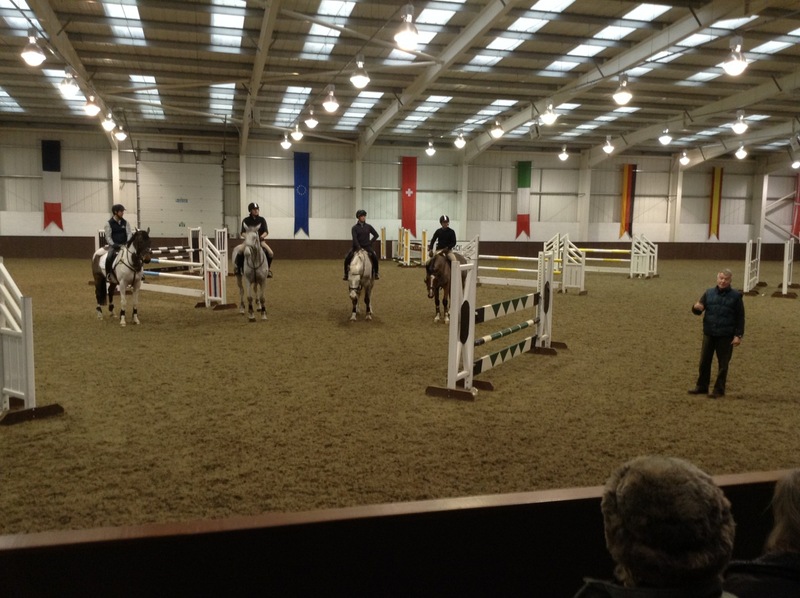 The dressage sessions were taken by Stephen Clarke, FBHS and the jumping sessions were taken by Yogi Breisner, FBHS. Both of these coaches really do not need any introduction! As usual, their coaching skills, expertise and imparted knowledge was outstanding and everyone who either partook as a rider or spectated, managed to take away nuggets of information that would help them with their future coaching and/or riding. Both coaches had full days of teaching: Stephen taught private or semi-private sessions and Yogi taught riders grouped according to the horse’s level of ability. Throughout the two days, Yogi and Stephen gave 100% and there was not one rider who felt that they did not benefit from their expertise and advice. The first day of any course is when the horses and riders settle into the venue, the psyche of the coach and it is when the coach finds out (often for the first time) the training needs of each horse. The recent stormy weather across the UK had meant that a number of horses had not been able to undertake normal work routines before the course and as a result were a little fresh at the start of the sessions. This energy was used to good advantage in many cases, as natural impulsion offered free of charge is rare! In all, Stephen coached a total of twelve riders per day and Yogi coached a total of twenty-five riders per day. All of the riders were either Fellows or BHSI’s apart from one Intermediate Instructor. Stephen’s horse ranged from a 4-year old Lusitano who had never been away from his yard to an Advanced horse ready to embark on his first Grand Prix; Yogi taught groups of riders ranging from young horses to those jumping comfortably at 1m 20cm. Stephen’s method of teaching is calm, focused and practical; he has the God-given knack of being able to pin-point exactly what is required to enable the rider to make improvements in their horse. Naturally, he adapted his plans and comments to each individual horse but he focused on rhythm, balance and contact. He expected looseness in the horses and asked riders to ride many transitions to ensure the horse was in front of the leg – ‘fast forward out’ was one comment often heard. Tense and/or stiff horses were asked to work over their backs in a round, deep frame thereby encouraging whole-body movement and better connection. He also asked riders to perform leg-yielding, shoulder-in, travers and half pass to improve and build upon responsiveness and suppleness. Stephen also suggested that the young horses would benefit from some gymnastic jumping exercises to improve reaction, suppleness and impulsion. As a world-renowned, FEI International-level judge, riders and observers benefited from his experience when he offered many useful training tips to help riders to gain higher test marks, such as the riding of canter-pirouettes on the centre line; he highlighted the difference between how a professional and amateur rider manages this movement to improve their marks. When the rider performed the pirouette like a ‘professional’, it was evident how much better the movement was executed. Other phrases and sentences Stephen used were: ‘Controlling from the outside rein and suppling from the inside’; when asking for a few half-steps in piaffe, he said he expected, ‘an electric reaction and then invite them into the rhythm’, and when working in passage, he expected ‘energy in slow motion’ and that the horse should come out of the movement in ‘fast forward’. One particular sentence that resonated with me was that after a training session, the horse should ‘go out humming to himself’. Overall, on the second day, as so often happens, the horses were more settled and really started to show better quality work. Yogi started his day at 0830hrs and ended at 1745hrs with only diet Coke to nourish him! From where he gets the stamina, I do not know! On each day, Yogi worked with his riders on a different theme. Yogi is a great communicator and is passionate about imparting knowledge to all he trains. In many similar coaching situations, the coach is inaudible when talking to and briefing his riders but Yogi insisted on standing his riders near the seating area, which meant spectators could hear and be involved in the sessions – much appreciated by all. Yogi knew many of his riders but not the horses, so he had to find out about them as soon as he could. 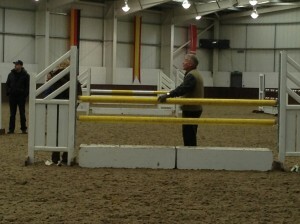 He asked them to warm-up in and around the jumps to supple them up and make them obedient to the riders. 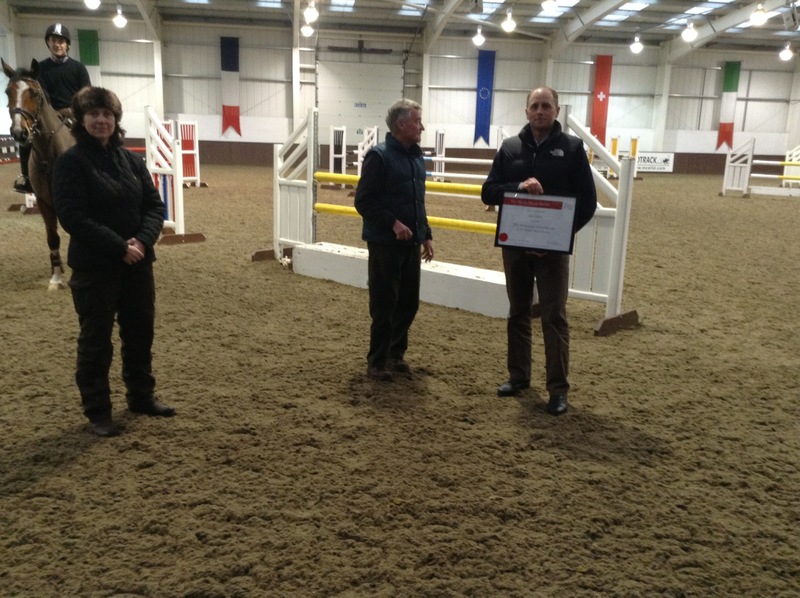 He also asked riders to perform transitions and lateral work, depending upon the horse’s ability and experience. On the first day, he worked riders over ground poles in trot, punctuated with walk transitions to gain better respect to the riders and to improve horse balance. Yogi explained how this exercise improved ‘foot/eye’ co-ordination. He then worked on an exercise using trot poles to walk, the trot to a placing pole and small vertical, land in canter, ride eight level strides to another small vertical. This exercise was ridden on both reins to improve, ‘rideability, expression and engagement of the hindlegs’. Yogi was adamant that the rider should not disturb the horse’s ‘rhythm, balance and co-ordination’. He also stated that ‘forward’ was ‘a mental attitude’ – something many riders are unaware of. Throughout the course, Yogi reminded riders that ’the rider is responsible for controlling the horse and not vice versa’. Once the riders had successfully negotiated the trot exercise, Yogi asked them to ride over a course of fences, which was progressively developed – especially with the youngsters. The accent was placed upon even, level canter strides between jumps so that the horses could settle into a balanced canter rhythm around the course and especially between related jumps. On the second day, Yogi began with a grid of bounce jumps. 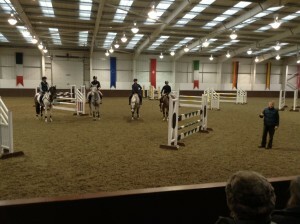 Initially, riders worked over poles on the floor set at a bounce distance; then the middle bounce of five was put up and riders cantered to this off both reins; ultimately, riders worked over five bounces to improve rhythm, balance and co-ordination. One of Yogi’s many coaching strengths was to adapt his exercises to the individual needs of the horses. In one earlier session, a young horse was reluctant to work down over the bounces so immediately Yogi adapted the exercise to encourage this horse to work confidently over the grid, whilst ensuring the other riders in the group were kept busy working on another exercise. At the conclusion of this session, the young horse that had struggled ended up jumping the five bounces as well as working over a small course of jumps including a water tray. Yogi went on to explain how ‘riding is about solving problems – what separates the men from the boys (women from the girls!) is that when things go wrong they can meet the problem head on and tackle it’. 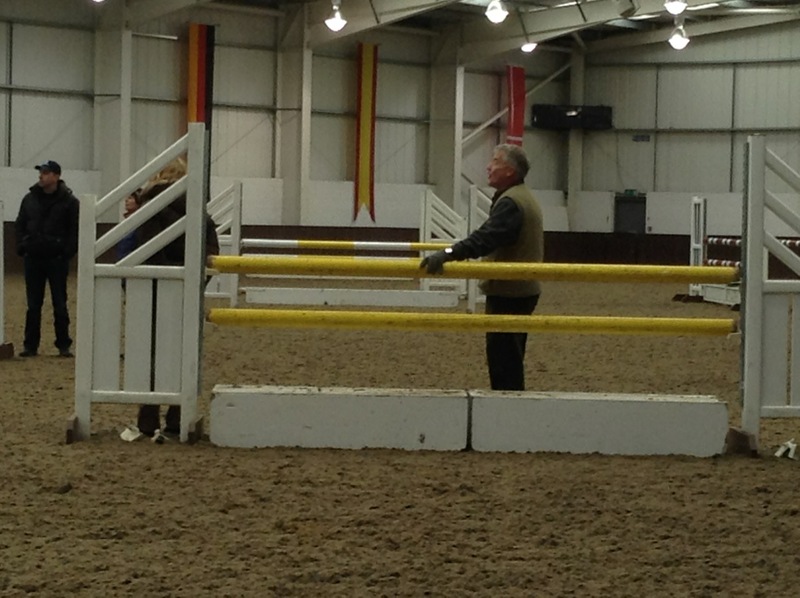 With all the groups, Yogi asked them to jump a course of fences working on level, even strides between fences and in particular turns between jumps, and explained in detail how the horse and rider needed to be positioned to enable optimum performance and approach. Some of the angles he asked the riders to attempt were challenging but even though some riders struggled at the start they all managed to successfully jump them at the end of the session. Both Yogi and Stephen were inspirational coaches over the two days and everyone went away from Addington feeling inspired to ride and coach to another level. With all the coaching expertise available throughout the two days, the opportunity was taken to run several training and study groups. 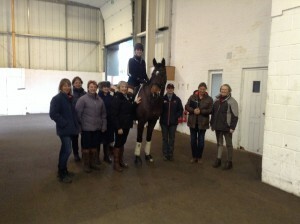 On the first day, there was Fellowship training given by Darryl Scaife and Sue Payne for those BHSI’s who wanted to find out more about what the examination entailed; on the second day, Lizzel Winter took a jumping Study Group and Jenny Ward took a dressage Study Group for interested persons – as one can imagine, both sessions were full within minutes of being advertised! Thank you to Stephen and Yogi, our two, very hard-working and inspirational coaches – it was great. A very big thank you must also go to Ann Bostock who organised the riders for the course; as anyone knows who has had to do this task, it is difficult but Ann made it look easy – thank you very much Ann. There was a minute’s silence in respect and remembrance of Molly Sivewright, William Miflin and John Hall who all died during 2013. Jillie Rogers (Chairman), Judith Murphy (Treasurer), Dianne Roberts (Secretary), Jeremy Michaels, Jo Winfield, Lizzel Winter, Ann Bostock, Andrew Fletcher and David Sheerin (Committee). Danny Anholt, Islay Auty, Carol Bennitt, Nicole Biggs, Carole Broad, Annette Christey, Helen Cole, Margie Craib, Alison Craig, Micheline Croolie, Sarah Dale, Maggie Doel, Liz Eaton, Cherry Elvin, Richard Evans, Hannah Fenech, Nikki Herbert, Fred Hodges, Eric Horgan, Mandy Holloway, Mandy Luesley, Sarah MacDonald, Lisa Morris, Philippa Muir, Hayley Newman, Sue Payne, Ann Peate, Annette Philpott, Susie Pilbeam, Gemma Porter-Rawlings, Patrick Print, Sue Ricketts, Kylie Roddy, Jayne Smart, Tom Searle, Fiona Stewart, Catherine Shine, Sarah Thorne, Jenny Ward, Hilary Westropp, Jonathan Willis, Karen Whiston, Sam York and Lynne Petersen – CEO British Horse Society. Welcome, we now have 206 paid up members this is all due to Judith Murphy. 2013 continued to be a busy year with the great unwashed British Public having a better idea of what horses and their riders can achieve following London 2012. Meanwhile the F&I Association has been equally as busy, especially a small group within the committee. Without these good ladies, Ann, Jude and Di, I would be very lost. Taking over in January last year from Jeremy and Jo, I had some large boots to fill. However, my typing and PC skills have improved! I must reiterate Jeremy’s thanks of last year to Sally Newcomb for the much easier to navigate website. This is a public site and we need to use it to sell ourselves. I must also thank Sam Champney-Warrener for setting up the Facebook page. Welcome to all those of you who use it – and use it we must. It’s there for members only so put out what you’re doing – others may benefit from your ideas. Don’t treat this page or the web page as only for reports. None of us who’ve gained these qualifications are shrinking violets because those people don’t usually become Fellows or I’s, so use these tools.